My favorite mode of transportation is walking. It is how I prefer to get around. It is no surprise then that my favorite parts of cities are downtowns, which are typically the most walkable areas. Pedestrians are the lifeblood downtowns, and without them they fail. If you don’t make the area comfortable, convenient, and interesting for pedestrians then nothing else you do will matter; walkers are that elemental to the success of any downtown. It should be no surprise then that too much automobile traffic—and the danger, noise, parking lots, and fumes that go along with it—is one of the things that caused so many downtowns to become unpleasant places by the mid-20th century. Therefore, it seems logical that banning cars from downtowns, and turning them over entirely to pedestrians,would be a really great thing to do. Sadly, it is not. It is something that works well in Europe, but it hasn’t worked in the US. We tried; you have to give us credit for that. We built about 200 downtown pedestrian malls between the 1960s and 1980s, and more than half of the have now been removed. Some observers estimate that as few as 30 are not in some stage of removal or redesign. In fairness, short stretches of alleys and lanes can be successfully pedestrianized in the US, such as Maiden Lane and Belden Place in San Francisco. A few cities have even made it work on their main streets (Boulder, Colorado and Santa Monica, California, for example) but the success rate is very, very low. When a concept fails 9 times out of 10, despite investments in the billions, it is time to let it go. I wish that wasn't the case. However, reality is what it is, whether we like it or not. American retail needs (for now anyway) automobile visibility in order to succeed. Americans like to cruise through a downtown first, scope out the good shops and see if they can score a lucky parking spot on the main drag, and then park around the corner, walk around, and enjoy the place as a pedestrian. Too many cars can hurt, but too few can starve. Like Goldilocks, we need to get it just right. An excellent example of getting that balance just right is University Avenue in Palo Alto, California (pictured below), which is a classic American "Main Street." It has one lane of traffic in each direction, on-street parking, and wide sidewalks. To free up extra pedestrian space, the street trees are planted in the parking lane. The street trees, by the way, are gorgeous, uniformly-spaced London Plane trees that have been limbed up to provide visibility for the retail signage. Despite the presence of a large and successful mall nearby, this is a very successful shopping district, and a wonderful place to stroll, even with the presence of cars. Density. European cities have a much denser residential population within walking distance of the pedestrian-only area, and these residents add 24/7 life to the streets and help support the shops. Tourism. The overwhelming flood of tourists staying in area hotels helps keep the car-free streets, and their shops, full of life and activity. Transit. Europe in general is less reliant on autos due to the presence of good transit systems. Many shoppers arrive by bus and train. Attitude. Although they’re catching up, Europeans have less of a cultural obsession with cars, and they expect fewer concessions to be made for the comfort of motorists. They take less offense at things like traffic congestion, parking meters, and closed-off streets. Context. European pedestrian-only streets are embedded in districts and cities which are also very walkable, in contrast with the American model of an island of walkability in a sea of pedestrian hostility. Design. The streetscapes in these areas are usually richly embellished with great materials and appealing, timeless motifs which match the beautiful historic architecture of the buildings. Scale. European pedestrian-only precincts are usually located in the medieval quarters of the city, which feature narrower streets that are sized just right for pedestrian-only situations (often only 15 to 40 feet wide) as opposed to wide American streets (80 to 100 feet or wider) which cannot be as easily filled with enough people to generate the hustle and bustle that makes shopping areas thrive. Nothing about the physical form is the same. Why would we expect them to behave the same? While I now live and work in the San Francisco area, I grew up and started my career in Fresno, a large city (population 509,039) in California. Fulton Street used to be the heart of the city, from its inception in the 1870s until the 1950s. The typical American story of downtown decline followed, with greenfield housing growth served by suburban shopping centers draining its energy. While it may have declined from its 1920s heyday, though, it was still pretty vibrant in the 1950s, as you can see in the photo below. Fresno removed Fulton Street and replaced it with the Fulton Mall, the second pedestrian mall in the nation. It opened in 1964 and was designed by the inventor of the concept himself, Victor Gruen. Gruen’s Fulton Mall was supposed to cure the area’s ills. It was conceived as a pedestrian oasis within an area retrofitted and “modernized” for the convenience of the automobile so as to be appealing to suburbanites. Like many of the pedestrianized downtown streets to follow in other cities, the scheme included one-way streets, high speed traffic loops, and clearance of nearby old urban fabric (which had historically fed customers to Fulton Street retailers in the first place) to make way for surface parking lots. The documentary embedded below, which was produced by Gruen’s firm not long after the mall’s opening, shows the idea behind the plan and the optimism that greeted it on opening day. However, although retail sales improved for a few years, the area had begun to decline noticeably by the 1970s. Soon, longtime anchors such as Gottschalk’s left, and by the 2000s the entire mall district had lower gross retail sales than one average Home Depot. The pedestrian volumes and retail activity that the Fulton Street experienced during its “decline” of the 1950s would be considered a runaway success today. Despite a huge investment, and plenty of time to catch on, it failed. Downtown Fresno has struggled for decades now (with notable exceptions, such as the work of Reza Assemi), and the Fulton Mall has been the most failed component of the district. The pedestrian volumes and retail activity that the Fulton Street experienced during its “decline” of the 1950s would be considered a runaway success today. Recently, architect Henry Beer of Colorado made a strong case at the State of Downtown breakfast hosted by Mayor Ashley Swearengin that the Fulton Mall should be removed and opened up to traffic. Kudos to the Mayor for bringing in a persuasive professional to make this case. He’s right. I’m happy to report that I, your humble correspondent, was right first. I made remarks similar to this post in support of the restoration of Fulton Street to the Fresno City Council during a public hearing in 2002. At this hearing, the Council was not yet voting on whether to remove the Fulton Mall, but whether to hire a firm to study the environmental impacts of doing so. A small cadre of us spoke in favor of the study, and a pretty large group were present to oppose the study. I have worked in government for 15 years, and have been to dozens upon dozens of public hearings, and I have never witnessed a more disrespectful crowd. They hissed, booed, and jeered at everyone who spoke in favor of opening the mall, and the whole thing got so ugly that a City Councilman who had one day earlier written a forceful op-ed in the Fresno Bee making an urgent case in favor of the study switched his vote and opposed it. The whole experience was so disturbing, and the conclusion was so contrary to common sense and all available evidence, that it was at that very moment that I decided to leave Fresno and seek out a job with a city where I could make positive contributions to the creation of a great downtown. It clearly wasn’t going to happen in my dear hometown. Thanks to Bruce Liedstrand, Susan Moeller, and Redwood City for giving me that opportunity. While it is true that we have often allowed our street designs to be far too oriented toward the automobile, the pedestrianized downtown street of the 1960s and 1970s was an overreaction. 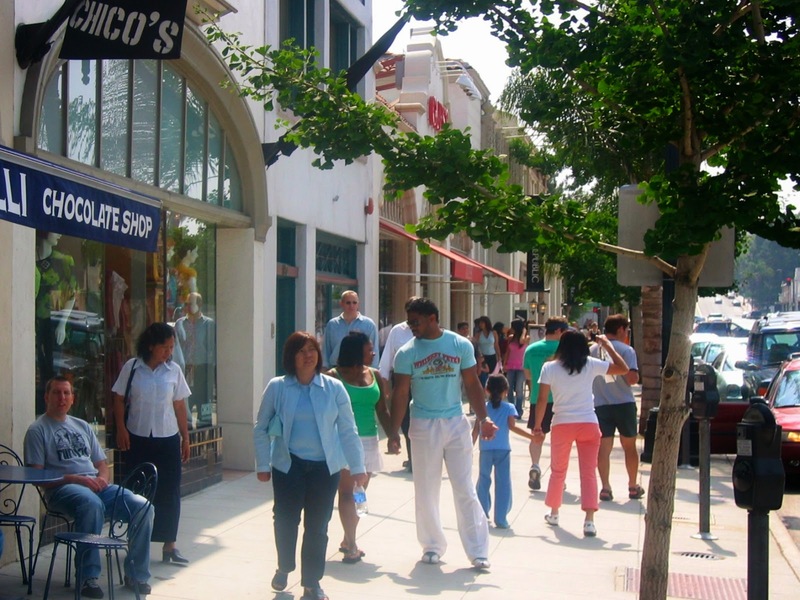 Streets can be very safe and comfortable for pedestrians, and successful for retailers, while still accommodating cars. The new Burlingame Avenue in Burlingame, California is just one of many excellent examples. You can even make major streets very comfortable for walkers, as Colorado Boulevard in Old Pasadena demonstrates. Streets are our most important public spaces, and they need to be nice, but in pursuit of niceness we can't undermine their economic viability. Balance must be achieved. It can be done, and it must be done, because the success of our downtowns depends on it. Thank you for this Mr. Zack. I am a current Downtown Fresno (and former Tower District) business owner. I only wish they would have listened to you all these years ago. Now we are still at Square One, which may be too late for many of us. It was somewhat disheartening at yesterday's State of Downtown breakfast to hear that we are so many years away from the realization of Fulton returning to a street. Thanks for the kind words, Melanie. I wish I had been wrong, because I hate to see an area with such great potential struggle. It has good bones and fabulous history, but good decisions need to be made to get it out of its slump. Best of luck to you and the boutique. What's up Brad! Still spinning vinyl? I hope all is well with you and my beloved old 'hood! Anyone familiar with Fresno will understand what I'm talking about when I compare Downtown with the Tower District. Friday night in the Tower District is where the action is. Pedestrians everywhere. Sounds of music and laughter coming out of every doorway, while the Downtown Mall is dark and desolate. At 5:00 pm, that sound of sucking you hear are the people fleeing downtown like rats leaving a sinking ship. I was born here, and grew up through the pre- and post-downtown mall eras. I remember my father saying: "It's going to ruin downtown". How prophetic. Wow, your father is the one with the foresight, not me! Way to go, Dad! I lived in the Tower District for several years, so I know exactly what you mean. I love it and miss it. It is a spectacular neighborhood downtown, but it has had to act in many ways as the regional downtown due to Fulton Mall's shortcomings. Fresno is big enough to support small neighborhood downtowns and a big regional downtown, too. I just stumbled onto your blog today, and thoroughly enjoyed it! And, I couldn't agree more! Have you kept up-to-date on the current situation with the Fulton Mall? The city was granted a 16 million dollar TIGER grant to reconstruct the Fulton Mall, back into Fulton Street! Construction is slated for June of this year. It is a very exciting time in Downtown Fresno, with new developments starting in numerous places, a new city green park that will break ground this summer, new lofts being added to the Pacific Southwest Building, and much more! I'd love to discuss more with you, as I also have a blog "www.vintagefresno.com" which focuses on the history and future of Downtown Fresno. Hope to hear from you! What about the third street promenade mall in santa monica? It has a similar story - converted from street in the 1960s, underwent extensive revitalization campaign starting in 1989, and now by your standards successful, right? 1. Even a broken clock is right twice a day. Just because a concept succeeds once, that isn't evidence that the concept is good--especially when it failed 200 times. 2. The original 3rd Street mall was similar to Fresno's Fulton Mall's park-like 1960s design. The more recent makeover restored it spatially to a formal urban street with the main pedestrian activity pushed up against the buildings and businesses and a roadway/median in the middle. It was designed to be a flexible space that could allow traffic, or be closed off to traffic. Only then did it thrive.